Except as otherwise noted, all Web addresses mentioned were functional as of 9-14-18. From the Cumberland Gap to the Atlantic Ocean, this is Virginia Water Radio for the week of September 17, 2018. This week, that excerpt of “Storm,” by Torrin Hallett, introduces an episode marking the Atlantic Coastline arrival of Hurricane Florence on September 14. At about 7 a.m. Eastern Time that morning, the center of that large tropical cyclone made landfall near Wrightsville Beach, North Carolina, bringing with it high winds, storm surge inundations, and heavy, flood-causing rainfall that would affect areas far beyond coastal Carolina. The unwelcome arrival and impacts of Hurricane Florence made this week an appropriate time for reviewing some basics about hurricanes. Following are six brief fact sets, based on a Frequently Asked Questions Web page from the Hurricane Research Division of the National Oceanic and Atmospheric Administration, or NOAA. 1. A hurricane is the strongest type of tropical cyclone, a rotating area of low pressure not associated with a weather front. Hurricanes are called typhoons in certain regions of the world. 2. Hurricanes are ranked by sustained wind speed on the Saffir-Simpson intensity scale, as follows: Category 1, 74 to 95 miles per hour; Category 2, 96 to 110; Category 3, 111 to 129; Category 4, 130 to 156; and Category 5, over 157 miles per hour. Each category has associated estimates of expected damages. The highest hurricane wind speed recorded was 253 miles per hour from Tropical Cyclone Olivia in Australia in 1996. 3. Hurricane intensity is also measured by how low the sea-level air pressure goes. The lowest pressure measured for an Atlantic basin hurricane was 882 millibars during Hurricane Wilma in 2005, compared to standard sea-level pressure of about 1013 millibars. 4. Hurricane intensity is essentially independent of hurricane size, so an intense hurricane is not necessarily a big one, as was the case with intense but relatively small Hurricane Andrew in Florida in 1992. 5. Storm surge is storm-generated, abnormal rise of water generated by a storm above the expected astronomical tide. 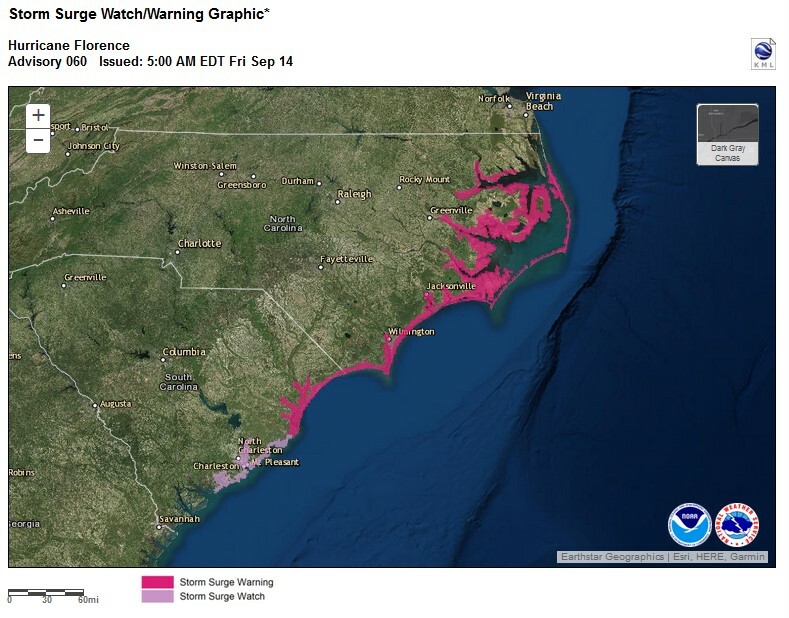 Storm surge flooding is one of the major threats from hurricanes, including Florence. 6. In United States history, the largest non-inflation-adjusted monetary damage caused by hurricanes was the estimated $125 billion dollars by Hurricane Katrina in 2005 and by Hurricane Harvey in 2017. Adjusted for inflation, though, the most costly U.S. hurricanes were the 1926 Great Miami Hurricane and the 1900 Galveston, Texas, Hurricane. There’s lots more to know about hurricanes, not least of which is how to prepare for them. You can get preparedness information from many sources, including the Virginia Department of Emergency Management, online at vaemergency.gov/hurricanes (http://www.vaemergency.gov/hurricanes/). “Storm,” a movement within “Au Naturale,” is copyright 2017 by Torrin Hallett, used with permission. “Tropical Tantrum” was composed for Virginia Water Radio by Mr. Hallett in May 2017. Mr. Hallett is a 2018 graduate of Oberlin College and Conservatory in Oberlin, Ohio. More information about him is available online at http://www.torrinjhallett.com/. Hurricane Florence centered over southeastern North Carolina, in a satellite photo as of 9/14/18, 4:37 p.m. EDT. (NOTE: UTC, or Coordinated Universal Time, shown on the photo is 4 hours ahead of EDT and 5 hours ahead of EST.) 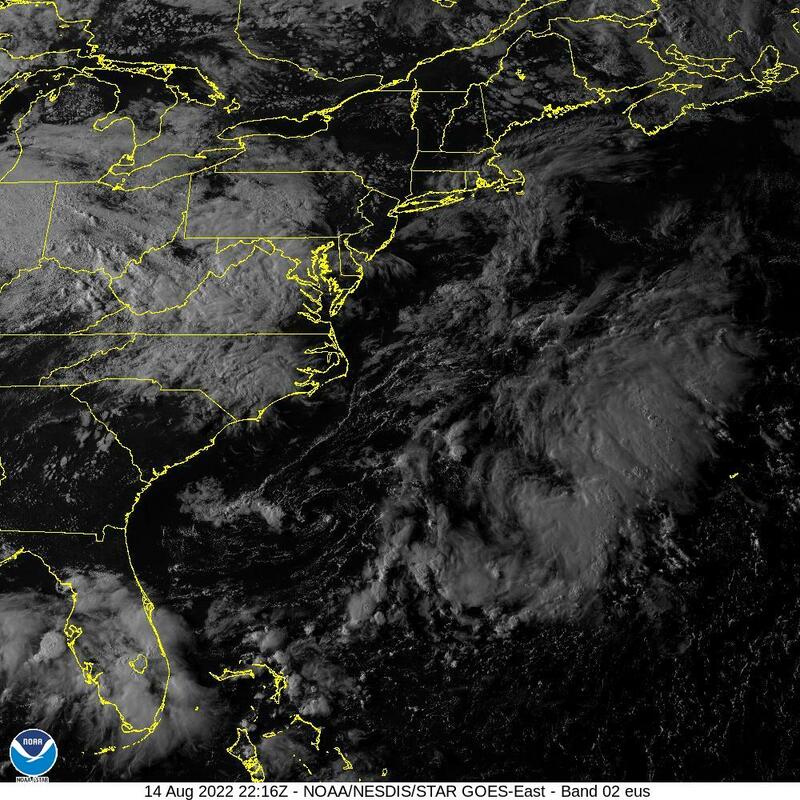 Image from the National Oceanic and Atmospheric Administration (NOAA), online at https://cdn.star.nesdis.noaa.gov/GOES16/ABI/SECTOR/eus/02/1000x1000.jpg, as of 9/14/18 at 4:45 p.m.
Average number of Atlantic tropical storms for 1996-2009. Graphic from the National Hurricane Center, “Tropical Cyclone Climatology,” online at https://www.nhc.noaa.gov/climo/, 9/17/18. National Weather Service image on how air pressure changes with height above sea level. Accessed at https://www.weather.gov/jetstream/pressure, 9/17/18. CNN, Hurricane Florence coverage, online at https://www.cnn.com/us/live-news/hurricane-florence-dle/index.html, as of 9/18/18. 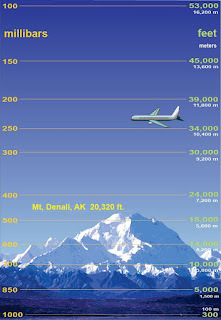 Encyclopedia Britannica, “Atmospheric Pressure,” online at https://www.britannica.com/science/atmospheric-pressure. 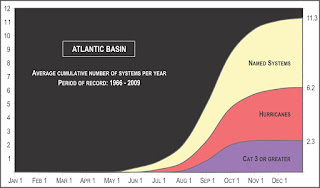 Max Mayfield, et al., “Atlantic hurricane season of 1992,” Monthly Weather Review, Vol. 122, pages 517-538, excerpted online at http://www.aoml.noaa.gov/hrd/Storm_pages/andrew1992/andrew_article.html. National Hurricane Center, “Costliest U.S. Tropical Cyclones Tables Updated,” Jan. 26, 2018, online (as PDF) at https://www.nhc.noaa.gov/news/UpdatedCostliest.pdf. 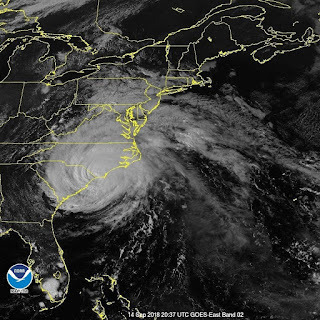 National Hurricane Center, “Hurricane Florence Public Advisory Archive, online at https://www.nhc.noaa.gov/archive/2018/FLORENCE.shtml?. National Oceanic and Atmospheric Administration (NOAA)/Hurricane Research Division, “Frequently Asked Questions,” online at http://www.aoml.noaa.gov/hrd/tcfaq/tcfaqHED.html. National Public Radio, “Hurricane Florence, ‘An Uninvited Brute,’ Brings Floods To N.C. As Wind Speeds Drop,” 9/14/18, 7:06 a.m. EDT. National Weather Service, “Jet Stream/Air Pressure,” online at https://www.weather.gov/jetstream/pressure. National Weather Service/Wilmington, N.C., Forecast Office, “Hurricane Florence Decision Support Briefing #15, September 14, 2018, 9 a.m., online (as PDF) at https://www.weather.gov/media/ilm/LatestBriefing.pdf (as of 9/14/18, 12 p.m.). American Red Cross, “Hurricane Safety,” online at http://www.redcross.org/prepare/disaster/hurricane. Federal Emergency Management Agency (FEMA), “Hurricanes,” online at http://www.ready.gov/hurricanes. National Oceanic and Atmospheric Administration’s (NOAA)/Climate Prediction Center, “Atlantic Hurricane Outlook and Summary Archive,” http://www.cpc.ncep.noaa.gov/products/outlooks/hurricane-archive.shtml. 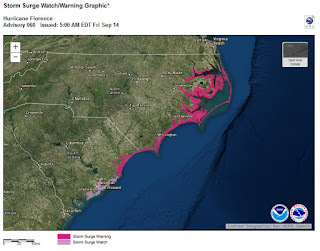 National Hurricane Center, “Storm Surge Overview,” online at http://www.nhc.noaa.gov/surge/. Virginia Department of Emergency Management, “Hurricanes,” online at http://www.vaemergency.gov/readyvirginia/stayinformed/hurricanes. Virginia Department of Emergency Management, “Know Your Zone,” online at http://www.vaemergency.gov/hurricane-evacuation-zone-lookup/. This site allows citizens to know whether or not they are in a zone most at risk from an approaching tropical storm, when emergency managers may be calling for evacuations or other actions. Virginia Department of Emergency Management storm surge items, online at http://www.vaemergency.gov/?s=storm+surge. Virginia Department of Transportation, “VDOT and Emergency Response” (including hurricane evacuation information), online at http://www.virginiadot.org/about/emer_response.asp. All Water Radio episodes are listed by category at the Index link above (http://www.virginiawaterradio.org/p/index.html). See particularly the “Weather” subject category. Following are links to other episodes on tropical storms. Episode 134, 10/29/12 – on Hurricane Sandy and storm surge. Episode 163, 5/27/13 – annual season-preview episode. Episode 215, 5/26/14 – annual season-preview episode. Episode 266, 5/18/15 – annual season-preview episode. Episode 317, 5/23/16 – annual season-preview episode. Episode 330, 8/22/16 – mid-season outlook. Episode 337, 10/10/16 – on Hurricane Matthew and storm surge. Episode 345, 12/5/16 – season-review episode. Episode 369, 5/22/17 – annual season-preview episode. Episode 385, 9/11/17 – on Hurricane Irma and storm surge. Episode 423, 6/2/18 – annual season-preview episode. 2.1, 3.1, 4.1, 5.1, and 6.1 all include: Current applications to reinforce science concepts.